Allen Iverson retired Wednesday. All our beloved sports heros retire, one day. Something about this one feels incomplete, though. Perhaps its because Iverson’s career has come to an end in a manner that seems open-ended. Its not because he did not win a championship — he’s not the only star player who didn’t. Its because we weren’t able to overload on A.I. He’s the type of player that you could never get enough of because he could not get enough — enough basketball, enough fun, enough love. Michael Tillery of The Starting Five Live was present at the retirement press conference, and I asked him to give me one word to describe the mood in that room. He said, “soul.” As I sat back and thought about it, A.I., or “Chuck” as he is affectionately called, brought plenty of soul to the game of hoops. His dogged play, his personal style, and his attitude were all soulful. Iverson’s crossover? Killer. His cornrows? Quite the same. Ann Iverson’s baby boy is a legend. An NBA legend. A Philadelphia 76ers god. He’s a an eleven time NBA All-Star and was Rookie of the Year in 1996, but the sad part is that his draft classmates, Ray Allen, Kobe Bryant, Steve Nash, Derek Fisher are all still in The League, and Steph Marbury continues to play in China. He gave us one of the most highly criticized and overused soundbites in all of sports with his “practice” rant. He is a case study in Athlete 101. He had it all, and lost most of it — the fame, his family, the money (although there is reportedly a great sum put away for safe keeping that he can’t touch until his mid-fifties), and the opportunity to truly revive his career and finish it in the fairytale manner we all expected. 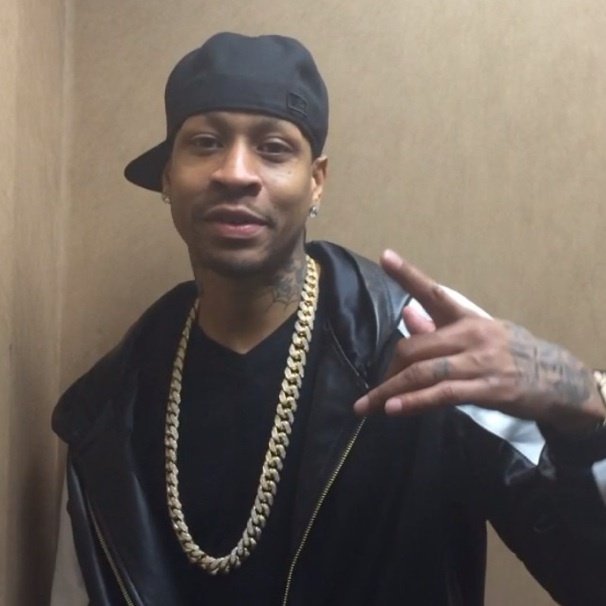 Allen Iverson is the embodiment of Ballertainment. He is perhaps a good example of what the little girl said about wanting more in a popular AT&T commercial. He says he’s happy with his decision to retire during this time. Is he being truthful? Who knows? It can be said that a lot of the reasons for his past troubles, and the results thereof, were because he wasn’t truthful with himself. When Tillery gave me the word “soul” today, I didn’t ask him to expound. It could have meant several things – Like, maybe the room felt all warm and fuzzy with blackness and that brand of LOVE that belongs strictly to Philadelphia and sounds like Teddy Pendergrass, or maybe A.I. bared his soul while sitting at that table, or could it be that his soul seemed empty as he said goodbye? Maybe it was all of these things. Maybe none.